In the Palácio Estoril Hotel you travel back in time, but on a journey that also continues in the present and into the future. Built in 1930, today´s Palácio Hotel retains many of the characteristics of that period. The ambience of exclusiveness that pervades the Hotel makes an impression on everybody who enters it, from its imposing, entirely white facade and beautiful gardens to its elegant classic decor, which has been updated over the years but without losing its combination of timeless, luxury and sophistication. During the Second World War, due to Portugal's neutrality several royal families went into exile in Estoril, which became known as the "Coast of Kings". The Hotel Palácio was the chosen home of numerous members of European royalty and was also the haunt of British and German spies, who could often be found in its bar. Later, these stories of intrigue and espionage inspired famous novelists and filmmakers and the Hotel served as the set for the James Bond movie "On Her Majesty's Secret Service". 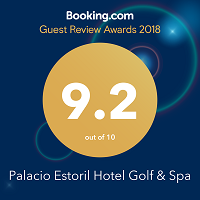 The Palácio Estoril was the second home of the Spanish, Italian, French, Bulgarian and Romanian royal families, and even today remains a favourite with their descendants. In February 2011, the Royal Gallery was created in their honour, where you can view photographs of the important members of European royalty who stayed at the Hotel. The Royal Gallery is now also one of Estorils tourist attractions. From the beginning, the Palácio has hosted heads of state, emperors, kings and princes, European nobility, the world's great artists, writers, sports champions, filmmakers and actors and many politicians who have shaped the destiny of the West. Private or State visits, festivals and major summits bring to the Palácio a long list of distinguished guests who mingle in the public rooms and corridors with all the Hotel´s other patrons. In the public rooms, corridors and even at breakfast one can often come across a Crown Prince, a film director, a European sovereign, an actress or an internationally renowned musician. The Palácio has been updated and has benefited from several refurbishments and renovations. Today, it offers all the comfort and convenience of a modern luxury five-star hotel while retaining all its charm of the olden days.